Your body requires very little vitamin b12 or cobalamin and most of us get sufficient quantities of it in our normal meals to satisfy our daily requirements. Although it's rare to see vitamin b12 deficiency symptoms it can still be useful to be able to recognise them just in case. You're most vulnerable to vitamin b12 deficiency if you've vegan and don't use the available dietary supplements containing vitamin b12. Infants breast-feeding from vegan mothers can also be at risk. Vitamin b12 supplements are generally regarded as safe because there are few known adverse effects of overdose. The main symptom that arises from vitamin b12 deficiency is a type of anemia that causes you to feel tired, weak and lethargic. You might also feel nauseous, constipated and become very flatulent (gas). You may also lose your appetite and suffer weight loss. 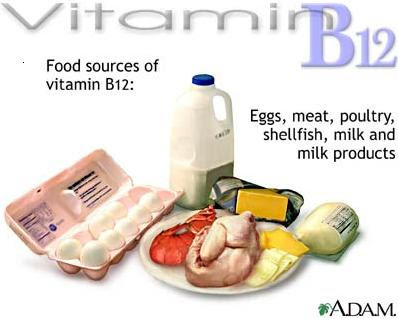 Vitamin b12 is commonly found in animal products like eggs, dairy, fish, meat and animal organs. B12 is rarely found in vegetables, which is why vegetarians and especially vegans who don't eat dairy products or meat, are especially at risk. If you fall into this category then you should consider using vitamin supplements containing b12. It's also important to realise that the operation of vitamin b12 is dependent on sufficient quantities of other vitamins being present in your body so you should take care to get a balanced diet to avoid vitamin b12 deficiency symptoms. Vitamins and Minerals: Do they work? Do athletes need more? Click www.gofastek.com for more information.